I had planned to make a “potato” salad substituting rutabaga for the potatoes. I cooked the rutabaga and boiled the eggs and then thought I really was not in the mood for such a heavy salad after all. So what to do when I was in the middle of making something else. Well, I repurposed the eggs for egg salad and set my mind to coming up with a new rutabaga salad. To go lighter I decided to use plain yogurt rather than mayonnaise. 1 rutabaga, peeled, chopped, and cooked. Peel and dice one rutabaga into chunks. Put in a saucepan and boil until tender but not mushy. These have substance and toothiness but no crunch. Removed from the heat, put in colander to drain away hot water and rinse in cold water so they quit cooking. Let cool in the fridge for half an hour or so. Add chopped onions, celery, and parsley. Mix together lightly. Mix the yogurt, vinegar, curry powder, and salt and pepper well. Stir into salad and toss lightly. Put in the fridge for an hour or more to let the rutabaga begin absorbing the flavor. Use your own judgment on curry powder, lots of people like things spicier than I do and some like it less spicy. The dressing is light and does not overdress the salad. You don’t want a pool of liquid in the bottom of the bowl. 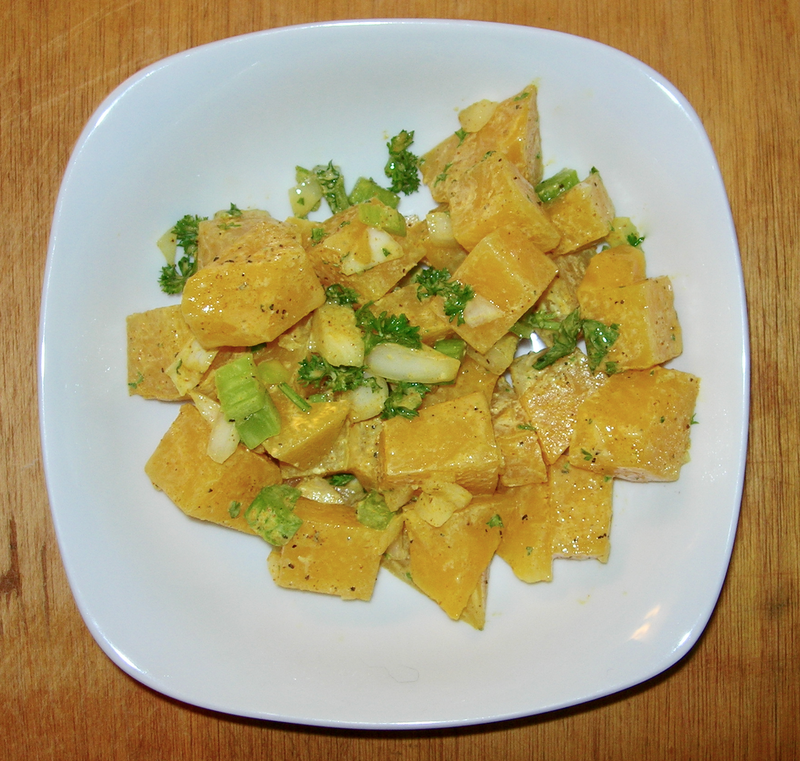 This is a delicious salad, the curry adds heat, the vinegar some brightness and the texture is wonderful, with just the right amount of bite. I made the salad dressing earlier and let it refrigerate so the flavors were mellowed and blended. I used a Magic Bullet™ but a blender or food processor would work even better. My inspiration was a Linguini al Melone I had several years back at Martinelli’s, a wonderful local deli that closed last year. The linguine has a melon cream sauce. It was as delicious as it was weird, so every taste, I was thinking this is so weird, it tastes so good. I thought melon might be just sweet and creamy enough to pair very well with rocket – which I have a lot of thanks to the Oregon Food Bank Harvest Share. Rocket is peppery and its bold flavor takes some thought to balance. Add everything together and pulse until smooth. You may adjust ingredients to your taste, but remember it is a dressing so you want the flavor more intense than what you would eat plain. It should be tart and sweet. Honey might be a good substitute for sugar, but I don’t have any except buckwheat honey and that is too smokey a flavor for this. Open a can of chickpeas, drain and rinse thoroughly. Drain so they are dry. You can pat them dry with a paper towel if you are in a hurry. Heat a cast iron pan on the stove a medium high heat, about 7 out of 10 on an electric stove. Add the chickpeas without oil and toast them, shaking the pan frequently so they do not burn. When they first begin to pop in the pan (just a little pop, not like popcorn) shake some salt and paprika on them and keep shaking and roasting until they are browned and slightly toasted. I would normally roast them in the oven but it’s over 90°. Cut a very small yellow onion in half length-wise, cut off the ends and then slice thinly length-wise for small strips of onion. Then chop two stalks of celery on the diagonal for nice thin, but longish pieces. Then add about 4 cups of rocket. You can see that about half the salad volume is rocket. Toss the chickpeas on top and stir. Add the dressing when you serve so the dressing does not make the chickpeas mushy. This is a delicious salad. There is the bite of the onion, the earthy celery, the peppery rocket and the smoky, salty paprika of the chickpeas and blended and worked together with the sweet and tangy cantaloupe dressing. This makes 4 servings, though you could make it in smaller batches and save the toasted chickpeas for something else. Since this will be pureed, there is no need to dice or chop finely. Big chunks are just fine, so long as they can cook evenly and will fit in blender or Magic Bullet. Heat 3 TBSP of butter (or olive oil for vegan option) at medium low (4 on a 10 point electric dial) in a large stock pot. Add 2 yellow onions and a bunch of celery, all chopped. Add salt and pepper. Cook until the onions have sweat and are translucent. While that’s cooking, chop up 4 large or 6 small apples. I used some Galas and a Pink Lady. Eating apples, not cooking apples because we are not adding any sugar. Crush and peel 3 cloves of garlic. Add the apples and garlic to the stock pot. Add tsp of thyme. Add salt and pepper. Put the lid on a let cook about five minutes. Meanwhile peel and chunk the celeriac. 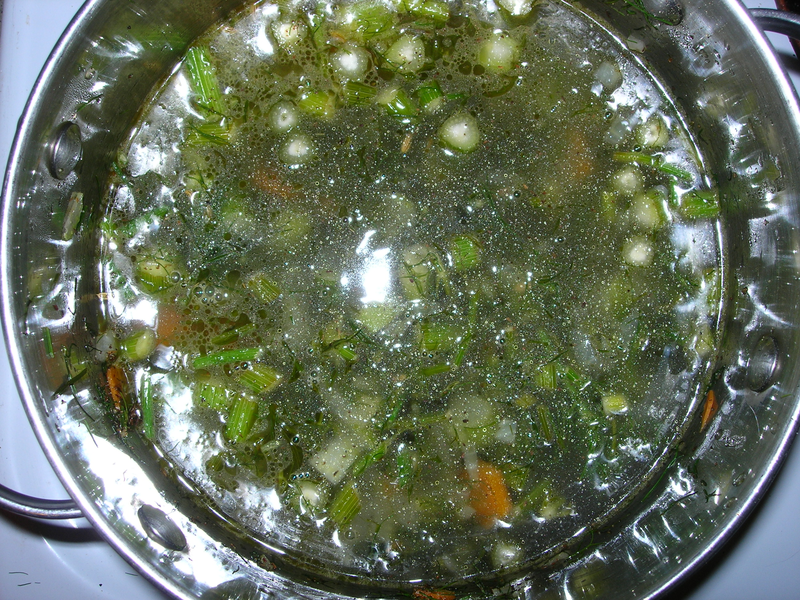 Add to the crock pot with 1 quart of vegetable broth. Add salt and pepper. Bring heat up to medium. When everything is tender, remove from heat and let cool. After it’s cooled down, puree with an immersion blender, blender or Magic Bullet. Serve hot with a bit of chopped parsley and toasted pumpkin seeds and, if you’re feeling ambitious, some thinly sliced pear grilled on a hot burner. I accidentally spilled enough pumpkins seeds to two servings in this picture. They were delicious, though. 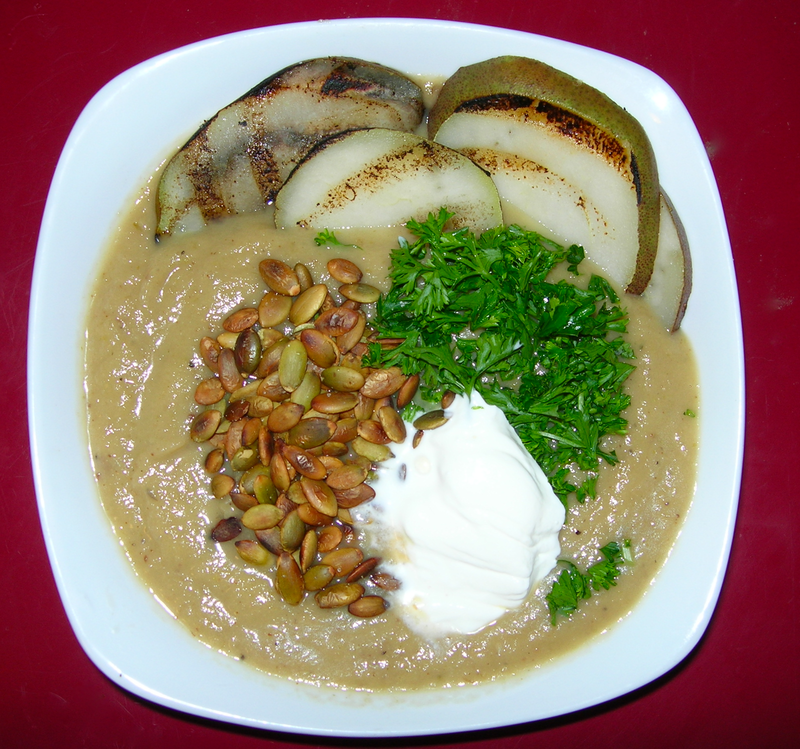 The soup is a smooth, mildly tart puree with a delicious, rich flavor. There’s a nice bit of bitter heartiness from the celery that is lightened and balanced by the apples, the onions adding some bright notes and of course, celeriac is always delicious. This makes about 8 servings, but it also tastes better as leftovers. In fact, it’s so much better the next day that I didn’t eat it the day I made it but let it wait overnight. Unlike most celeriac purees, I don’t add any cream so it will keep several days and can also be frozen. This is a shot at the big cooking pan full of vegetables and the beef shank I braised with them since it makes about 8 servings and the shank will be pulled apart to add bits of beef to each serving. This takes several hours in the oven, so you must plan ahead, but it takes very little to prepare. To begin, I warmed olive oil on medium heat is a big pan. I shaved about 1 tsp of nutmeg into the oil using a microplane. I added 6 peppercorns and a tsp of cinnamon. 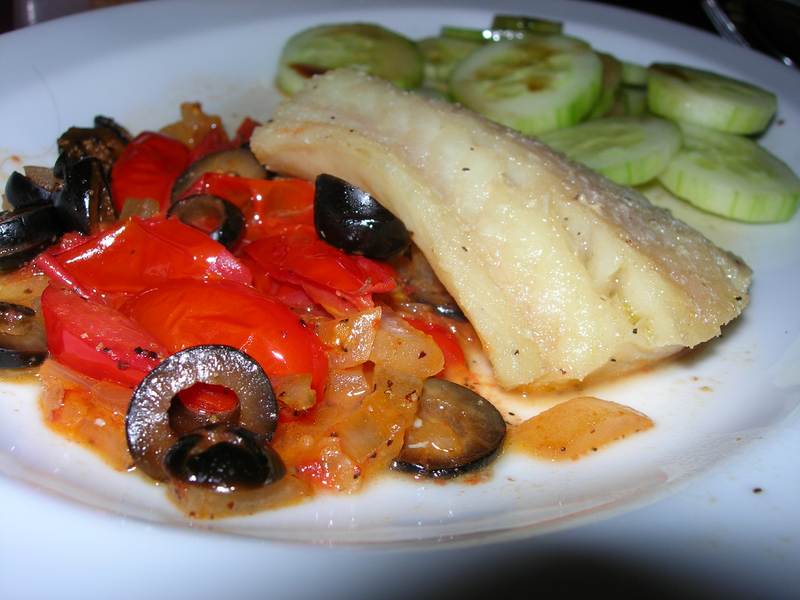 I let the oil heat until the spices thoroughly infused the oil and the air was rich and aromatic. This is enough nutmeg to be spicy, to leave a bit of tingle on your tongue. You can use less, but I love the flavor it brings. I added the beef shank and let it brown on both sides, about 3-4 minutes per side. While it was browning, I chopped 1 and a half onions and 2 stalks of celery. Removing the shank from the oil and setting it aside while I sautéed the vegetable. I added the onions and celery and let them cook. I added some salt and pepper. I turned the oven on to 350° to pre-heat. I chopped up the carrots, potatoes and smashed and peeled the garlic gloves. When the onions were transparent, I added these veggies and let them cook for a few minutes. I added some salt and pepper. Then I added the Italian beans and diced tomatoes and stirred everything together. I added some salt and pepper, then I tossed in a bay leaf and put the shank back in the pan. Remember that adding salt and pepper throughout the cooking builds flavors more effectively and helps avoid over-salting at the end. I put the pan in the oven and let it braise for the next 3 hours. It was delicious, spicy and aromatic. It made at least eight servings, so I stored it in an airtight container and reheated for several meals. I had a huge and easy salad for lunch today. I made a big bed of chopped romaine lettuce. Here’s an easy tip for cleaning your lettuce to avoid contamination. Just put the uncut leaves in a bowl of white vinegar for a bit and then shake off the vinegar, it will kill more bacteria than rinsing under cold water and unlike hot water, will not make your lettuce limp. While the lettuce is soaking in vinegar, you can toast a handful of almonds to chop and toss on top of the salad at the end. I cleaned 1 stalk of celery, cut it in half lengthwise and then sliced both pieces on the diagonal. I placed that on top of the lettuce. I drizzled the dressing left over from making my grapefruit and asparagus salad yesterday. It makes a dark dressing and I thought the salad would just look better if it was mixed into the lettuce and celery rather than on top of the cheese and grapes. Then I sprinkled on some feta cheese, more than I intended because I was shaking some on and it would not come and not come and not come and then a whole bunch fell out at once. But it’s not like a little too much feta will ruin anything. I then tossed some red seedless grapes on top that I also rinsed in vinegar. I usually cut them in half, but I was feeling super hungry and in a hurry. It makes no difference to the flavor. I sprinkled on the almonds and then generously sprinkled tajín on top of the salad. Use salt and pepper or any other spice blend you might like. It has a nice mix of flavors and textures and brings in enough indulgence with the grapes, feta and almonds to be very satisfying. I love a grilled sandwich, especially on rye bread. Rye bread has such a rich, nutty taste and grilling only enhances that unique rye flavor. I buttered two slices of rye bread. I spread the butter as thinly as possible. I laid the two pieces of bread on a medium high griddle and toasted them on one side. While it the first side was toasting, I buttered the other side of the slices. I flipped them over when the first side was crisped and then grilled the other so they were both nice and crispy. I could have toasted the bread, but it would not have the same nutty flavor that gets brought out by grilling buttered bread. 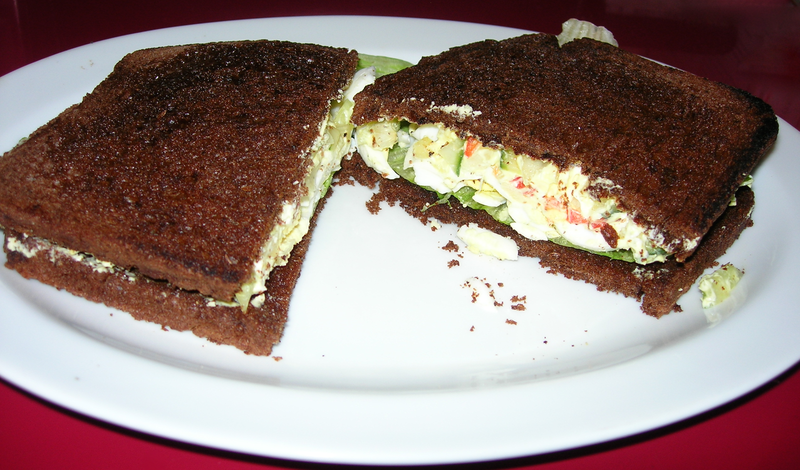 To make this sandwich filling, I chopped and mixed up 1 TBSP each of yellow onions, celery, red pepper, cucumber, 1/2 tsp of mustard, salt, pepper and just enough cream cheese to hold them together in a spread (about 1.5 TBSPs. This made a thick, creamy spread. I also sliced up two hard-boiled eggs. 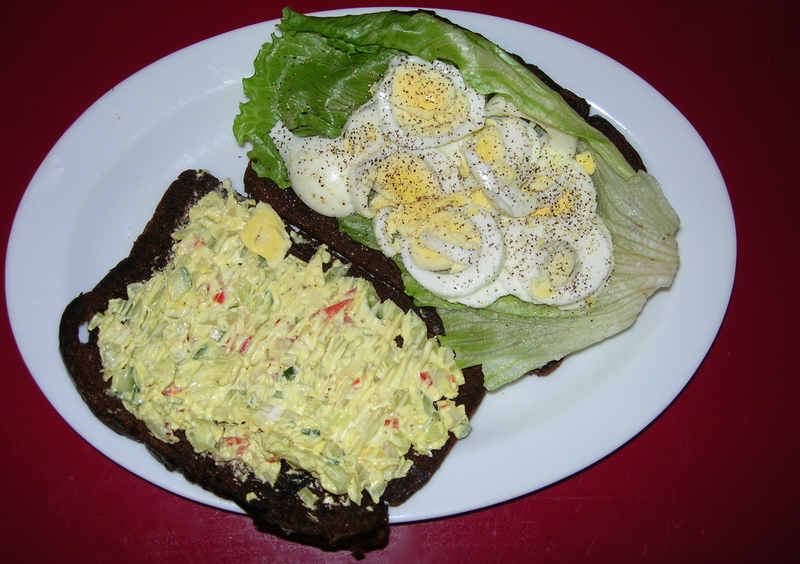 When the bread was grilled, I laid it on a plate, spread the cream cheese and veggies on one slice and laid some romaine and sliced hard boiled eggs on the other with a dash of salt and pepper. To make good hard boiled eggs, put them in a cooking pot with about 1 inch of water over them. Bring them to a boil and remove from the heat, putting a lid on top to hold in the steam. Let them rest 6 to 11 minutes depending on how much you want them done. I like mine well done. The crunchy bread and crispy celery with the creamy sauce, tender cucumber and eggs all mixed together in a wonderful blend of flavors and textures. Makes one serving. The apartment manager came by this morning with someone from Sherwin-Williams to see about fixing the problem with my flooring. I had a Earl Grey pork roast in the oven and the apartment smelled like a dream so I asked her to come by later for lunch. 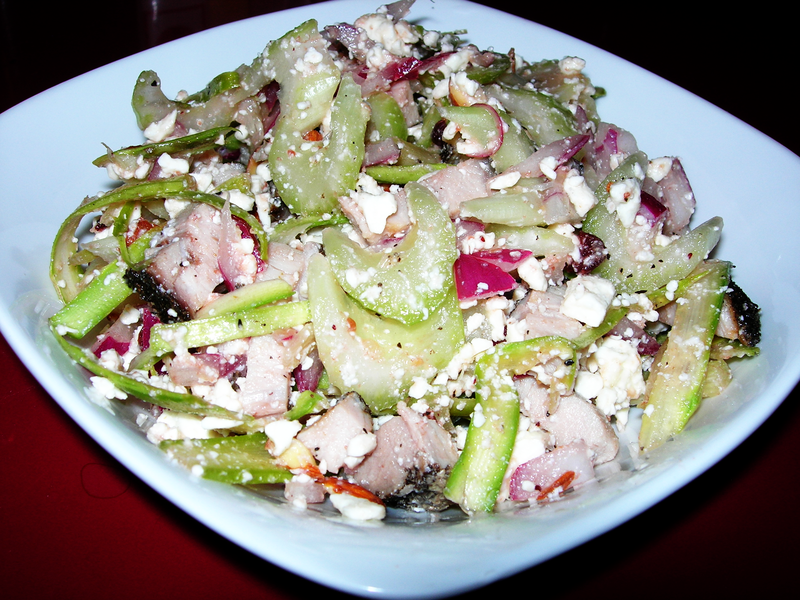 I served some Fresh Asparagus Salad with the roast pork. It was delicious, but she asked for apple sauce. I didn’t have any, so I suggest trying lingonberry preserves. They were the first she has ever had and she is already planning a trip to Ikea. Anyway, her enjoyment of the lingonberries, which she put on both the roast pork and the salad inspired me to try to come up with a lingonberry vinaigrette and salad. Of course, I named it after to Serena as she was the inspiration. The asparagus strips are not very substantial, so I knew I needed another vegetable to give the salad some body or the pork would overwhelm it texture-wise. I opted for celery since its flavor is mild and in the same wheelhouse as asparagus Also, the crispy texture would be a plus. I added some red onions for color and to balance the feta. I knew I wanted some cheese, but though parmesan would not be as happy with the roast pork as feta. The chopped almonds are the crack that makes all salads irresistible. I used two slices of roast pork, which I weighed out at 3.1 ounces, sliced them into small pieces and tossed them in. In a separate small bowl, I put in 1 TBSP of lingonberry preserves, the juice from 1/2 of a fresh lemon, 1 tsp of olive oil and 1 TBSP of red wine vinegar and mixed it altogether. It was tart and sweet and had a real bite to it, though tossed with the entire salad, that bite was mellowed out to a perfect tartness.